We've previously examined the mid-century cooling, but another common "skeptic" argument is that the early 20th Century warming proves that the current global warming could be natural. Although there was a significant increase in global temperature in the early 20th Century, the rate of warming from 1910 to 1940 was lower than the rate of warming from 1975 to 2005, at about 1.3 vs. 1.8°C per century, respectively. That being said, it's worth taking a look at what caused the early century warming. Several different factors contributed. However, since there may be indirect solar effects not accounted for in the direct solar radiative forcing calculation, we'll conservatively estimate the solar climate sensitivity parameter as equal to the CO2 climate sensitivity of 0.8 (Wm-2K-1). Thus at equilibrium, the solar change would be expected to cause a 0.15°C increase in the average global surface air temperature. Simlar to the anthropogenic contribution, the best estimate of the solar contribution to the 1910-1940 warming in Meehl (2004) is approximately 0.1 to 0.15°C (Figure 4). The "skeptic" logic behind this argument is usually that if the early 20th Century warming was as large as the late century warming, and was natural, then the current warming could be natural as well. NOTE: this post is also the Advanced rebuttal to "It warmed before 1940 when CO2 was low"
In the decades after 1945 there were over 500 nuclear bombs exploded in atmospheric tests. Sometimes averaging 2 per week. All that stratospheric injection of dust and soot suggests a mini nuclear winter. Wrong Reindeer. In 1941, just below the Arctic circle in Canada the temperatures reached the level of a Palm Springs summer, 101 degrees, if I remember correctly and that summer temperatures which normal average 50 degrees were way higher, 70 degrees if I recall correctly. I am away from my research at the moment. The cause, I say, was a methane hydrate explotion below in the Arctic area that leaked the great heat the hydrates contain out of an Arctic pingo during the summer. They began drilling in the Arctic at Norman Wells in 1921; they began extensive water flooding in the late thirties while gearing up for WW II. Fresh water makes methane hydrate. It is methane emmissions we need to stop not CO 2. And STILL not accounting for the oceanic interdecadal variability, which is a good explanation for the 1940 blip and for part of the 2000's blip as well and this is what the current climate models are not accounting for. The models you cite do not reproduce this blip, and it definitely is a problem. It is NOT just about external forcing You should already be aware of that. Also, using linear relationships for temperature changes (delta T = lambda x delta F) is a gross oversimplification because we KNOW climate is nonlinear (and so are feedbacks). Just because the models do reproduce the last 30 years with the supposed sensitivity combined with human factors doesn't mean they would "know" what actually has happened. [DB] There is no robust evidence (AFAIK) showing that oceanic cycles affect the global land+sea temperatures, as Tamino thoroughly shows (here and here for starters). "It is methane emissions we need to stop not CO2." Both are important but neither the concentration of CH4 in the atmosphere nor the isotopic concentration of that CH4 give any evidence that methane is much of an issue at the moment. See the RC article on methane risk. Frankly, the problem at moment is CO2. "And STILL not accounting for the oceanic interdecadal variability, which is a good explanation for the 1940 blip and for part of the 2000's blip as well"
What's your reference for this? Are you referring to Swanson and Tsonis 2009? DB, To be fair in your response to Protestant you claimed that Tamino showed that the AMO does not affect the global land-sea temperatures but that's not an accurate statement. Tamino's analysis there isn't great and I had a long drawn out "discussion" with him in the comments section if you'll notice. We agreed to disagree. A better discussion of the AMO is probably here: http://rankexploits.com/musings/2011/the-atlantic-multidecadal-oscillation-and-modern-warming/ and subsequently in the comments. All in all the AMO probably did contribute more to the mid century warmth than people give it credit but that was in addition to the other factors mentioned by Dana. Together they created the 1940s warming. [DB] Robert, I accede to your judgement on this matter of the AMO. In that the referenced links above also considered other oceanic cycles (and other exogenous factors) that Tamino has studied, like the PDO, my comment was more dealing with overall picture. I have read & re-read your exchanges with Tamino & respect very much both of your opinions. I will also re-read the Rank Exploits post again. Out of laziness I only referenced a few of the many Tamino posts on cycles. A search of the Open Mind site will reveal those; the rest can be found at the Archives (except for January and February 2010 posts). You are courteous as always. Either way though, for me its not a big issue. I think that the 1940s are mostly irrelevant to the climate change we are dealing with now anyways. Explaining the 1940s warming using models just needs a little bit more fine tuning, i.e. ramp up one parameter versus another for example. I've often wondered how it is that modelers and some of my colleagues think that factors do not change how much they can contribute through time... i.e. 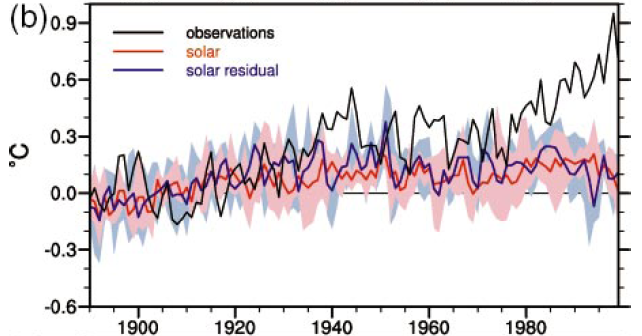 maybe the reason the 1940s are not as well explained using models is because they rely on the response of the planet to be constant through time to a given factor (solar for example) when it very well may not be. For the record, I specifically mentioned the contribution of oceanic cycles in the article, so I don't know what more Protestant could want. I guess if you don't attribute 100% of every climate change to natural cycles, he's not happy! It seems that most proxies start climbing at the beginning of the XXth century and even before, and have achieved most of their growth by the 70's. When I compare with Fig 5., doesn't it seem to imply that this growth is essentially natural and not anthropic ? [DB] You have interpreted the meaning of Fig 5 backwards. Look at it again. Natural forcings simply do not explain the rise in temperatures we physically have measured to occur. Period. Over at WUWT they recently highlighted a paper that suggest TSI may be even smaller than you are assuming here. Maunder Minimum to present would be something like 0.33-0.66 W/M2. I think that would mean solar forcing for the period you're interested in here is ~1/3 what you are suggesting. Which seems problematic for your calculations. Gilles, are you just being deliberately blind or *what*? Take a look at the graph-you've got a slight warming trend in the first 40 years of the 20th century, then a leveling off between 1950 & roughly 1980, then a much faster rise in temperatures between 1980 & 2010. This is odd given the fact that TSI/Sunspots have been trending downwards from 1980-2010. So no, I'd suggest it *doesn't* imply that the growth is natural. If it is natural, then please tell us what the cause of it is. Ah yes, HR, "Watts Up With That"-the bastion of truth & decency in the Climate Change debate.....*not*. The fact is that directly measured sunspot numbers rose significantly over most of the first half of the 20th century, but sunspot numbers have been *falling* over the last 30 years-yet the fastest warming has been over the latter 30 year period. So how do your mates over at WUWT explain this obvious discrepancy? That will only work if magnetic variation is the primary driver of total solar irradiation, and from the language used in the paper this seems to be largely speculative. Now I am curious to see where you are going with this. Are you arguing that neither CO2 nor the sun drives our climate? I think the conclusion is correct, but there is a weak point in the demonstration. Meehl et al. (2004) used the reconstruction of solar irradiance by Hoyt and Schatten (1993, J. Geophys. Res. 98, 18895-18906) as their solar forcing. As shown in the Figure 7 of the review article by Gray et al. (2010, Reviews of Geophysics 40, RG4001), the amplitude of centennial variability of Hoyt and Schatten (1993) is similar to that of Lean (2000), though not exactly the same. On the other hand, Wang, Lean and Sleeley (2005) estimate much smaller variability, and it seems that the more recent estimate is more plausible. Then, logically, the simulations by Meehl et al. (2004) likely over-estimate the role of solar forcing in the real world (assuming that the solar forcing is due to the total solar irradiance). DB#9, Marcus#11 : my question wasn't about the post-70 instrumental rise, but about the "hockey-stick" shape of all proxy curves, that start rising much before the 70's. Does it mean, yes, or not, that the pre-70 rise of proxies temperature reconstructions can only be natural and NOT anthropogenic, and if not, what can it be ? "The truth is that whichever version of PCA you use, the hockey-stick shaped PC is one of the statistically significant patterns. There’s a reason for that: the hockey-stick shaped pattern is in the data, and it’s not just noise it’s signal." "The hockey stick is so thoroughly imprinted on the actual data that what’s truly impressive is how many things you have to get rid of to eliminate it. There’s a scientific term for results which are so strong and so resistant to changes in data and methods: robust." 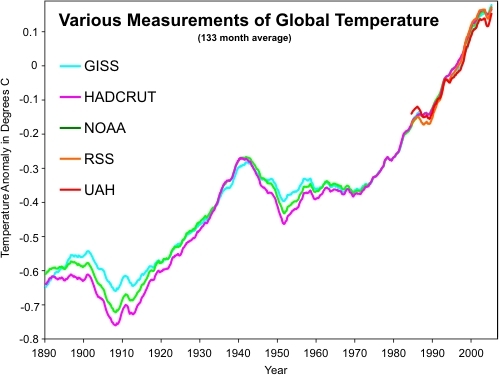 Peer-reviewed reconstructions and studies have consistently shown a multifactorial warming of the globe, with the graphed data taking the shape of a hockey stick. That natural factors post-1970 or so do not explain the rise in temperatures measured since then does not also mean the converse: that only natural factors explain the rise before it. That is a strawman and wrong. 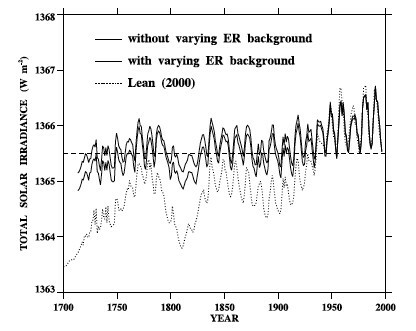 If the solar forcing was less important in the early 20th century, does it mean that that warming was more due to GHG? HR and Kooti - it's entirely possible that less than 0.15°C of the early 20th century warming is due to solar effects. I don't see that as problematic. Gilles #15 - the equilibrium warming from the CO2 increase from pre-industrial levels to 1970 is 0.64°C. So I'm really not seeing your logic as to how pre-1970 warming was only natural. Clearly there was a major anthropogenic component over that period. "Gilles #15 - the equilibrium warming from the CO2 increase from pre-industrial levels to 1970 is 0.64°C." I don't see any significant anthropic temperature change before 1970 in your figure 1, so can you clarify this point ? where is the 0.64 °C anthropic warming in models ? "The hockey stick is so thoroughly imprinted on the actual data that what’s truly impressive is how many things you have to get rid of to eliminate it. There’s a scientific term for results which are so strong and so resistant to changes in data and methods: robust."" I understand that it is statistically significant and robust. BUT I asked if it was ANTHROPIC. You say that it "does not also mean the converse: that only natural factors explain the rise before it", but again, I see on Fig 1 that anthropic changes of temperature were almost zero before 1960, and that natural changes closely match observations before this date. If this doesn't mean that only natural factors explain the pre-1960 warming, what does it mean? i'm sorry , I may miss something really important, but I don't get your point at all. Put in other words : can you give me the amplitude of the NATURAL component and of the ANTHROPIC component of the warming, between 1900 and 1960 ? you seem all to think that everything is perfectly clear, so I expect a simple answer to this simple question. 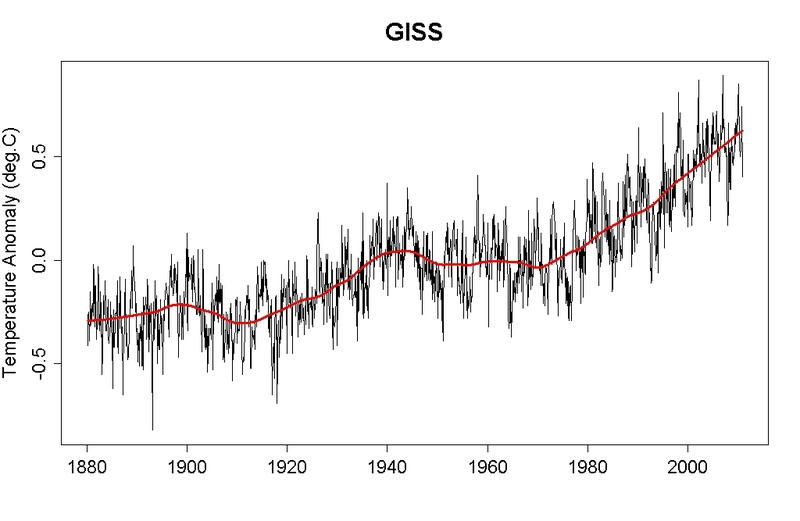 The NASA GISS indicates warming since 1979 to be greater than the 1910 to 1945 warming. The CRU and Hadley SST indicate the 1910 to 1945 warming to be greater than the recent warming. "I don't see any significant anthropic temperature change before 1970 in your figure 1, so can you clarify this point ? where is the 0.64 °C anthropic warming in models ?" The anthropogenic (this is the correct term by the way, not "anthropic") warming prior to 1970 is close to 0.2°C. 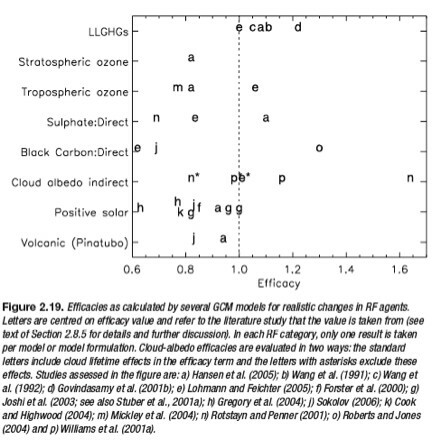 The equilibrium figure I cited (0.64°C) does not take the ocean lag or non-CO2 forcings like aerosols into account. Regardless, Figure 1 shows that the vast majority of the 20th century warming was anthropogenic, so I still fail to see your point. The figures in the article answer your question. Pre-1970, the roughly 0.3°C warming is approximately half natural and half anthropogenic. Solar and "ocean cycle" hypotheses can't explain the majority of the warming over the 20th century, and can explain very little of recent warming. The two hypotheses tend to contradict each other. If one maximizes the solar effect, this leaves little room for PDO/AMO warming in the early 20th century, thus little room for such an influence in the recent period - and we know the solar influence has been flat or negative (given the last decade) in the recent period. If one minimizes the solar effect, this allows for some other forcing to explain the early century warming. Assuming anthropogenic attribution is precise, let's arbitrarily assign the rest to PDO/AMO. But then one has to explain why cooling in mid-century was very modest. If solar variation has little influence, and PDO/AMO "forcing" is significant, what kept temperatures up? If most of the early century warming was PDO/AMO, where was the same magnitude of cooling? And why hasn't it cooled in the last decade? Why has global mean temperature shot up over the last 100+ years through complete ocean cycles? The magnitude of solar forcing does indeed have a fair amount of uncertainty. It's interesting to see contrarians start to move away from solar variation, which presumably has something to do with a very deep recent solar minimum, which has failed to reduce global mean temperature as hypothesized. But then they're back to trying to explain MWP/LIA. Fred Singer would not approve. The PDO/AMO indexes correspond with ENSO variation. In the late 70's, we had a transition from more la Ninas to more el Ninos. Much of the short-term trend over that period can be explained by that transition (similar to the early 1940's activity), but nothing more, and we've had a transition back since then, but strong warming over the entire period. GISS land/sst of course does indicate a lesser Early Twentieth Century warming than contemporary, but the CRU, missing from your chart, does not. NYJ #22 - well said. CW #23 - The planet is made up of both land and oceans. Please stop cherrypicking whichever is most convenient for you to make your incorrect argument. The point is the peer-reviewed work (GRL I think) not that it shows up on WUWT, deal with it on that basis. The point would be that changes in TSI do seem to be too small to account for climate variability in the way we seem to understand it. What can I say, I'm trying to look at the science. There has been a constant revision of our understanding of TSI variation. Somebody can correct this if inaccurate, estimates of changes in TSI from MM to present have undergone constant revision. 3-6 W/M2 in the late 1990's. 1-2 W/M2 more recently. And now this paper is suggesting it's ~1/3 of that amount (0.33-0.66 W/M2). I think if your going to use the word speculative then you should put it into context. The short history of this science is one of constant revision as I've outlined, I don't see that this is any more speculative than the other. I think the unique approach is to say magnetitic variation is the sourse of other solar variations, I guess we have to wait and see whether that is accepted. "Now I am curious to see where you are going with this. Are you arguing that neither CO2 nor the sun drives our climate?" It does seem curious. I don't think one has to jump all the way to the idea that CO2 or the sun don't drive our climate but I think it's worth considering that of our understanding of the subject is missing something important. Ian if that work is accurate how would you interpret it? "HR and Kooti - it's entirely possible that less than 0.15°C of the early 20th century warming is due to solar effects. I don't see that as problematic"
That seems a little cavalier. Do you accept that what Kooiti says is accurate? As he points out those estimates of solar variability you are using are already out of date even ignoring the new paper I pointed out. You write an article that says roughly half the warming is from solar then suggest even if this is not true it really doesn't matter. I don't get that. I've got a few separate technical questions. 1) What was the magnitude of warming from 1910-1940, you didn't state it? I'm assuming you think it's 0.3oC (half from CO2, half from solar) but this graph, from the climate graphics page, puts it around 0.5oC. Maybe those extra 0.2oC don't really matter as well? 2) Are you assuming the earth came to equillibrium in this period? Is past articles you have suggested that we may have only realised 33% of the warming associated with the post-1950 forcing. Yet here all warming has been accounted for from the forcing in these 40 short years. Can you explain this discrepancy? HR #26 - you managed to fit a whole lot of strawmen into one comment there. "You write an article that says roughly half the warming is from solar"
Sorry, where did I say that? I'm pretty sure what I actually said is that if the TSI increase was 1 W/m2, then the temperature increase due to solar effects was roughly on par with the increase due to CO2. "What was the magnitude of warming from 1910-1940, you didn't state it?" I said the trend was 1.3°C/century, which gives a magnitude of about 0.4°C over the 30 years. You really shouldn't make assumptions. If I believed it was half CO2 and half solar, I wouldn't have also mentioned oceanic cycles, volcanoes, aerosols, etc. "Are you assuming the earth came to equillibrium in this period?" No, I most certainly am not. "Is past articles you have suggested that we may have only realised 33% of the warming associated with the post-1950 forcing...Can you explain this discrepancy?" Yes, the discrepancy is due to the fact that I never said that. We've actually realized about 60% of the warming associated with the post-industrial forcing. so again dana : how do you interpret the "hockey stick" shape of proxy reconstruction, whose rise is almost entirely observed BEFORE 1960 ? is it mainly anthropogenic or natural? you said that anthropogenic component does not exceed 0.2 °C before 1960, but that is well inside the natural variation, so what happened to produce the "hockey stick" shape of proxies reconstruction (barring the instrumental records) ? Moderator Response: [DB] Please, no more all-caps (cf. Comments Policy). HR, the warming rate for 1910-1940 was less than +0.12 degrees per decade. The warming rate for 1980-2010 was almost +0.17 degrees per decade. I'd call that a pretty stark difference in warming rates-especially when we consider the major factor driving the 1910-1940 warming-namely rising solar irradiance-were *absent* during the 1980-2010 warming phase. Dana's chart (taken from my post) does include Cru. Cru=Hadley which is HadCrut (Land/ocean). Dana, you say it's pure non-sense, but on the thread you're citing, figure 2 you clearly see that the black curve (proxies) grows only in the first part of the XXth century, and saturates just when anthropogenic influence is supposed to dominate. So , looking at proxies only, is the rise beginning in 1900 mainly natural, or anthropogenic ? in other words : do the proxies show something unusual associated with the anthropogenic component, or not ? Marcus : "HR, the warming rate for 1910-1940 was less than +0.12 degrees per decade. The warming rate for 1980-2010 was almost +0.17 degrees per decade. I'd call that a pretty stark difference in warming rates"
Really a stunning statement , in my sense : I do not any field of science where this would be qualified as a "pretty stark difference" given the number of different factors that can interfere and the complexity of the system - usually the qualitative difference are measured by a number of sigma above the natural variability (Signal to Noise ratio). "in other words : do the proxies show something unusual associated with the anthropogenic component, or not ?" in the rate of global temperature rise. "Really a stunning statement , in my sense : I do not any field of science where this would be qualified as a "pretty stark difference" given the number of different factors that can interfere and the complexity of the system - usually the qualitative difference are measured by a number of sigma above the natural variability (Signal to Noise ratio)." Its not a stunning statement at all, Gilles, only to people like yourself who refuse to accept the link between GHG's & Global Warming. Funny how Signal to Noise ratio never stops Denialists like yourself from claiming cooling trends over time periods as short as 3-5 years (even when plotting the data shows no such thing). In each case, I'm relying on over 400 data points (about 420 months) to draw my graph-that does a huge amount to reduce the signal to noise ratio-& what we're clearly left with is a *much* faster rate of warming in the period of 1980-2010 as compared to the period of 1910-1940, in *spite* of a lack of an obvious forcing for the 1980-2010 warming period (in fact, solar forcings are declining during that period). So come on, Gilles, stop your hand waving & tell us-what's causing this rapid warming if solar forcings are in decline? Marcus : "2nd, we already know that proxies which rely on dendrochronology have proven very unreliable post-1960"
I see that the "hockey stick" of proxy reconstruction is pretty well defined before 1960 - so just forget about the post-1960 data, and please give me an answer to my simple (again) question : if the shape of proxy reconstruction before 1960 is "reliable" , was it mainly controlled by anthropogenic influence or by natural ones? there is a second question : if proxies have "prove to be very unreliable" post-1960, how do you prove they were reliable before 1900 ? concerning the " *much* faster rate of warming in the period of 1980-2010 as compared to the period of 1910-1940", it is not by repeating it constantly that it will become true : I still do not know any field of science where two measurements (as precise as they may be) giving a slope of respectively 0.12 and 0.17 °C/decade would be qualified as "very different". We're talking of an approximate indicator (the average surface temperature has *no* clear physical meaning in any equation of physics) of a highly complex and non linear system with ill-known cycles , not of a precise measurement of fine structure constant by high accuracy laboratory measurements. and the 0.12 °C /decade was also "much higher" than the previous centuries, if I believe in "very reliable" proxies before 1900. So how do you explain this "much higher value" of 1900-1940 slope with respect to the previous time intervals ? "So come on, Gilles, stop your hand waving & tell us-what's causing this rapid warming if solar forcings are in decline?" Why do you think I should know the answer? believing we should answer any question at any moment is a religious attitude (religions explain also everything !) , not a scientific one. Can you answer the question of what has caused the rapid warming between 1900 and 1940, compared to previous epochs? to your question, "how do you prove they were reliable before 1900 ?" This is getting somewhat off-topic, but still has something to do with temperature. But when discussing 'proof' in an uncertain science, it is much more reasonable to use terms like 'degrees of certainty' or 'confidence'. There is no way to 'prove' that tree rings are exact matches for temperature, but the degree of confidence is given to dendro-proxies by how well they match up with other proxies. Does that mean that the entire sequence is definitely correct for that particular Briffa proxy? No. That is why you see the larger error bars around the warm periods. I found this review paper to be helpful in understanding the issues surrounding divergence. grypo : but do you agree that if the proxies cannot reproduce the most recent warming, it is very uncertain to use them as evidence that they weren't similar warm periods 1000 years ago, if error bars are large ? for me, it's a rather simple conclusion based on usual scientific method - it is just an unreliable indicator, period. I can't understand why it would have become precisely unreliable just when you're measuring a new effect - that's undoubtedly a worrying issue. The reason why I feel the paper is particularly speculative is because the authors' argument is essentially this: other reconstructions of TSI disagree, and since we feel that the sun is as quiet as it can be can, the condition at MM should be similar to the present day. I don't see the authors addressing why this estimation is necessarily better than the others, nor do they address why the other reconstructions disagree. There must be some different physics that goes behind those constructs, so can those differences be ignored altogether as I think the authors are doing? But as you said, we probably have to wait to see what the conclusions are in a few years. Now to answer your question. If the theory is indeed correct, it doesn't affect our understanding of CO2 as a greenhouse gas. The implication will be that the climate is more sensitive to forcing changes than we know. It will also remove any hopes that the sun will enter another MM-like phase and bring in another little ice age to counteract the effects of anthropogenic CO2. In addition, the change in the solar forcing is by no means large enough to suggest that there is some unaccounted for process going on to cause the 1900-1940 warming. This divergence talk should be in a divergence thread, but I will respond to this last comment and then let it go. No, I do not think it is very uncertain to use them as evidence for past temperature. I think specifically Briffa's proxy for estimating temperature over specific time scales is somewhat uncertain. But it doesn't matter what I think, and that's the good news. The experts are very aware of this issue and are working to come to an agreement. The bad news is that until that is done, there will considerable disagreement on how to inform the public of this uncertainty, while portraying the best possible answers to certain questions. Other than Richard Alley and the late Steven Schneider, most climate scientists aren't experts in this regard. Dendro people are dendro experts. There are certain choices made in charts that reasonable people can disagree on how to display. This is definitely the case with multiproxy reconstructions. If you want to discuss those options, please do it in a relevant thread. I think you should keep in mind that 1) not all tree ring records show divergence. It is geographically limited. 2) temperature records have been reconstructed from other proxy data as well. Moderator Response: [DB] Hot-linked URL. sorry all, but I was not talking about divergence, it was only a side remark. I am not talking about post-1960 points. Forget the sixties and later, imagine that we're discussing in 1960. I'm just asking if the pre-1960 rise, visible in proxy reconstructions, is mainly natural, or anthropogenic. Figure 2d of Meehl et al 2004 will give you the answer: mostly natural, small anthropogenic contribution. The same thing cannot be said for post 1960. I'm still trying to figure out why Gilles is asking questions which are very clearly answered in the article. right, it was only to be sure, so I go on cautiously. So you're saying that if you look at the following curve , before 1960, i.e. by hiding the post-1960 part (I could wipe off the last half century if you have no finger to do it), then, the shape is perfectly natural and can be produced only by natural variability ? There is no such thing as a "natural shape". The shape does not tell us whether it is natural or not. That can only be obtained via understanding of the underlying physics and forcings that are involved. That is precisely what the scientific literature does (and what this post discusses). Gilles, the "hockey stick" shows a ~0.4°C temperature increase from 1900 to 1940, and ~0.3°C increase from 1900 to 1970, just like the instrumental temperature record. As I have said several times, a significant percentage of that small warming is anthropogenic. I hope this is the last time I have to say it. I also don't know why you're referencing the 1999 'hockey stick'. I provided a link to more up-to-date reconstructions in Comment #30. I'm sorry dana but I don't understand. Figure 1 shows no statistical anthropogenic warming between 1900 and 1940, but you say that a significant percentage of that small warming is anthropogenic ? I can't get your point . Which percentage and why is it "significant" ?